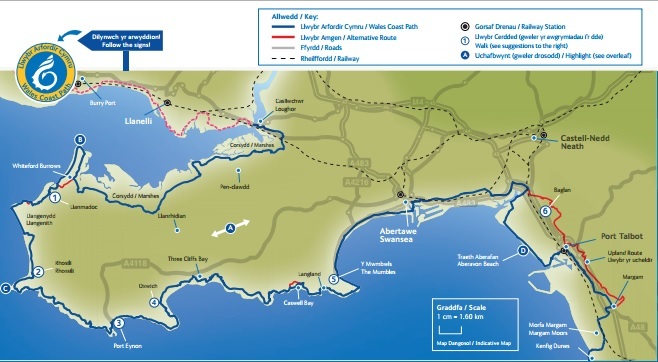 “While the Coast Path is important for the Welsh economy, it is also seen as an important initiative in encouraging both locals and visitors to discover and enjoy Wales’ outdoor spaces and the health and welfare benefits it can provide. If you go here you can see a photo montage of scenes from Gower. You might like to check out the rest of Gower Writer's website while you're there. There is lots to see and do in Swansea and Gower, but many people who love to walk are drawn here by the challenge of walking the whole length of the Coast Path. The Gower section is 53 miles or 86 kilometers. The whole Coast Path is 870 miles or 1400 kilometers. It's quite a challenge, but you don't have to do it all at once! Come and see us, you won't regret it! Reblogged this on Welsh Events - Business Events, Social Events, Sporting Events & Charity Events in Wales.